This year we waited a little longer than normal to hit the road. Part of that was happenstance. The other part was wanting to get great prices on things as the season wore down. As always, I wanted to share a little bit about our adventures—what went well, what went wrong and how money factored into all of that memory making. 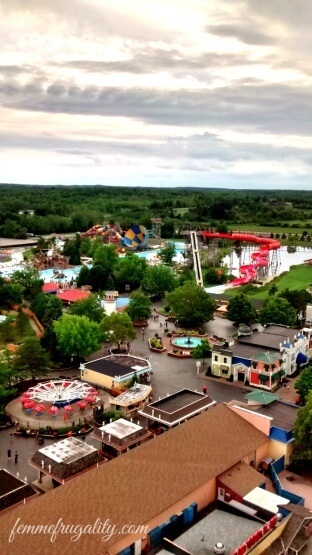 The first trip we took this year was to Niagara Falls and Darien Lake. We had wanted to take a big, upstate tour this year, but medical bills got in the way so we had to abbreviate our trip. At first we were a little bummed, but we had so much fun in these two locations alone that we totally forgot about any disappointment. We stayed upstate, but when you’re visiting the Falls, you have to go to the Canadian side. The views are better. There’s more to do. It’s as if the US recognizes that they can never compensate for the natural beauty that the border gives Canada, so they’ve given up on investing in their facilities. Normally when we visit it’s during the day, because bed time. But this time we got into town a little later and there was a huge backup on the Rainbow Bridge. The guy who checked our passports says it happens every August—people realize summer is ending, so they flock to those places they wanted to go before school starts and leaves turn. One of those places is Niagara Falls. The fact that we went at night was a happy accident. 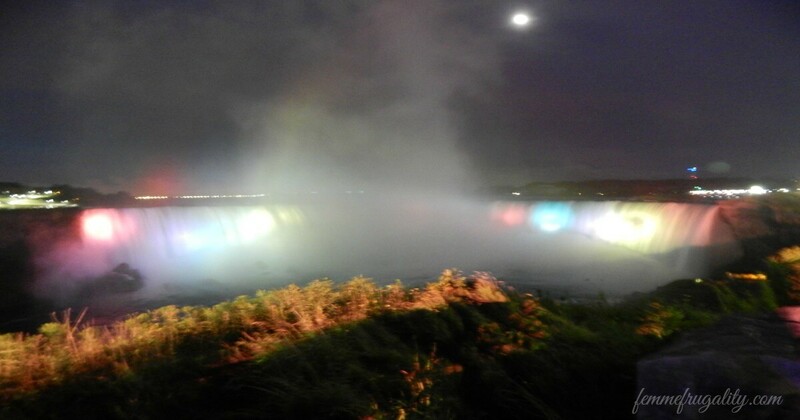 I had never seen the Falls lit up in person, and it was a super neat thing to see. Our kids convinced us we needed to buy them overpriced light up toys. They’ve got a really good sales funnel going on there. The guy at the stand blows a bunch of bubbles to reel the children in, and then shows them a table full of $10 toys. I figure next time we can just bring our own glow sticks and hopefully sate them. It was good to feel like they were at least visible when we were crossing streets, though. 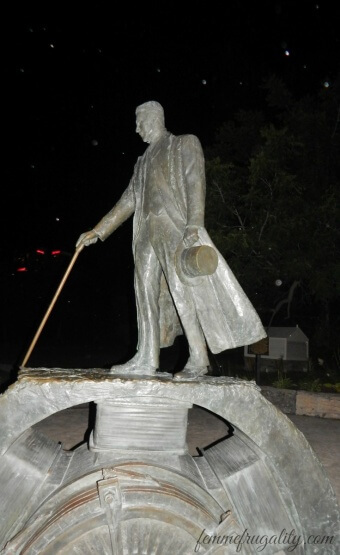 We also got to check out the Tesla statue, which I was really excited about. It was apparently there the last time we went, but I hadn’t even heard about it. We showed it to the kiddos and had a conversation about green energy, the health of our planet, and imagination and innovation. Who knows. Maybe someday they’ll save the world. Goodness knows someone is going to have to in their lifetime. My littlest really wanted to check out the Niagara Sky Wheel, but we couldn’t find a parking spot close enough to accommodate little walking legs. No worries, though. We met that want the next day. We did eat dinner at the Queen Victoria Place restaurant. The views were spectacular, as was the service. But the food was not really great at all, and prices were sky high. Thank goodness that either the Canadian dollar fell since the last time we were there or the US dollar gained some traction. We still paid too much, but it wasn’t as devastating as the Canadian price would have us believe. The next time we go up there, we’re packing a meal to eat on one of the grassy knolls over by the Tesla statue. Because no one should have to pay that much for dinner—especially when the food is terrible. We did get to watch a fireworks show from our outdoor seats, though, so that was another happy circumstance. 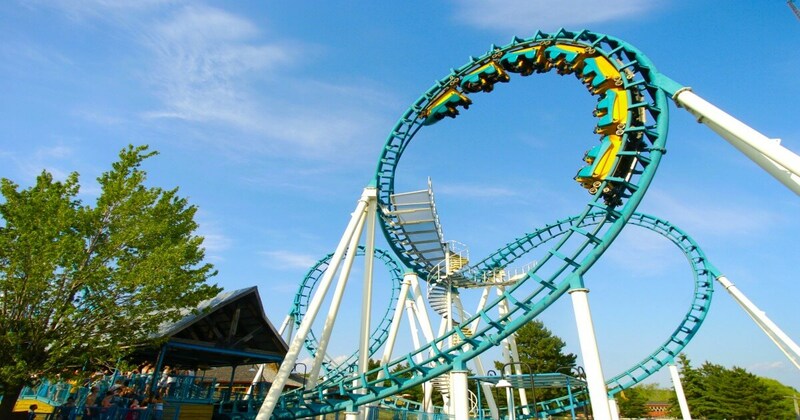 The next day, we spent our time at Darien Lake. For those of you from Pittsburgh, it’s like Kennywood and Idle Wild/Sandcastle all combined into one. It definitely feels older than Six Flags would, but that’s probably because it is. 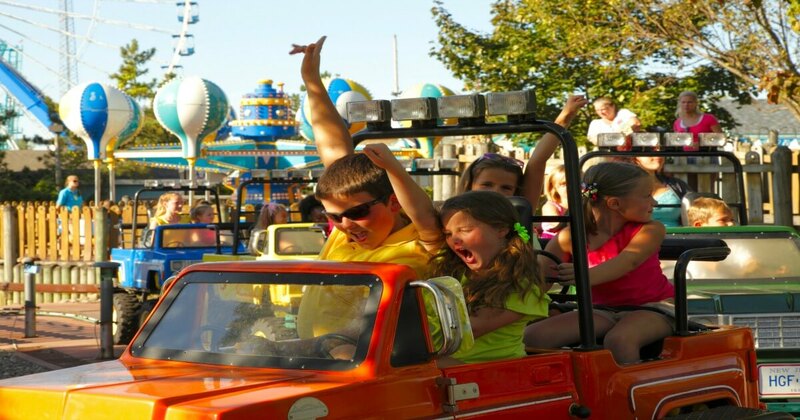 They keep adding new and innovative rides, though, and maintain the facilities well, so you get the best of both worlds: old charm and exciting rides. The last time I was there I was a teenager. This experience was a bit different because I was there with my husband and two very young children. While I totally predict that both my kids will grow up to be coaster heads a la Lisa Kudrow in The Unbreakable Kimmy Schmidt, height restrictions kept us to the kiddier parts of the park this time. 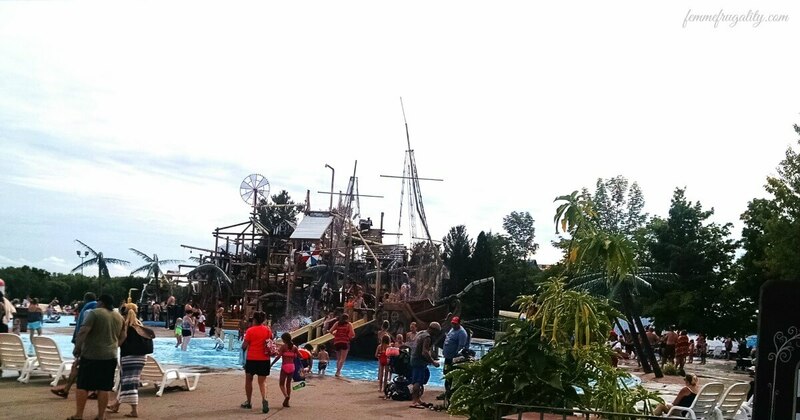 We spent the vast bulk of our time in Hook’s Lagoon where our kids played on a pirate ship, “rode” on floating animals and creatures in the kiddie pool and shot water guns on their climb up to the slide. Initially, the slide freaked me out. Our youngest had to ride down with an adult, which I thought was great, but our oldest was apparently too big. There are sensory issues with that one, and I wasn’t sure how going down a water slide for the first time without an adult was going to pan out. I stood at the bottom wracked with anticipation, waiting for them to appear around the curve. When they did, it was with a huge smile on their face. As soon as they got to the bottom, they were up and climbing the steps to do it again. The Ferris wheel, aptly name the Giant Wheel, is actually incredibly cool. 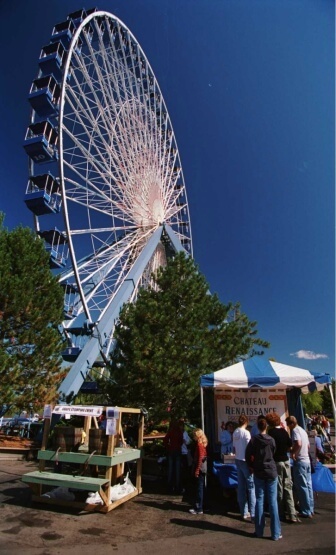 Originally, it was built for the 1982 World Fair in Knoxville, Tennessee, and was the largest Ferris wheel in the world at that time. Right now, it’s the second largest in North America. As you could imagine, the views were spectacular. I’d also highly recommend doing this first because it gave us a bird’s eye view of the park, which allowed us to get a really good view of all the rides and attractions. When we got off, we were able to head in the general direction of the kiddie rides because we had seen the entire park’s layout. Other highlights included the merry-go-round, the Haymaker (which made Dad and me sick, but the kids giggle with glee,) and finding a $2 game that gave everyone a prize no matter what, which was perfect for our kiddos. We didn’t get food in the park; instead we stopped at a local place on the way back to the hotel. Again with the picnic idea, though. Short trips can be just as good as long ones. We had a great time on our little sojourn, and it reminded us that short vacations can be as valuable as long ones when it comes to the fond memories we end up storing in our brains for years to come. This entry was posted in travel on August 19, 2016 by femmefrugality. Wow, Niagara Falls looks beautiful at night with the lights. We went back in April but didn’t go at night (same reason…had a little one so had to take into account bedtime!). Looks like you guys had fun on the trip. We did! And we certainly didn’t plan to be out that late—Rainbow Bridge was CROWDED! We drove right by Niagara Falls a couple of years ago on a road trip and didn’t have time to stop. After seeing your photos at night, though, I’m convinced we need to go and stay so we can see the lights. We’ve had so many great little trips within 3 hours of our house. It really doesn’t matter where you go – just taking the time to spend together having fun is what’s most important! Thanks for sharing the highlights of your trip! The night Prince died they lit them up purple. RIP. And I’m with you on mini trips! Can be so worth it and costs so much less! I LOVE niagara falls and ferris wheels 🙂 I think I’m still a kid at heart.. and I’m getting more immature as the days go by! The rainbow bridge that I went was so cool and I remember taking a boat and getting somewhat (not really) close to the waterfall which was so exciting. It looks like you had a fantastic vacation to relax and recharge and spending time with family is always great! Haha you and my kiddo should be best friends, then! And Maid of the Mist? Have done that before, though not with the kids. Will be on our list next time!